Blue Sky BuildersSkywriters Garage BlogBlue Sky BuildersWhat Are the Options for Finishing the Interior of My Garage? What Are the Options for Finishing the Interior of My Garage? If your garage has an unfinished interior with exposed studs, you have probably wondered about the options for insulating and finishing a garage. After all, the garage is one of the most-used rooms in your house. In fact, if your garage is attached to your house, it is probably your most-used entryway. You will get daily enjoyment out of your investment in finishing this space. For a typical 24’ x 24’ two-car garage, you should be able to insulate and finish the garage walls and ceiling for under $5,000, including top-quality labor and materials. If your garage is attached to your house, the wall adjacent to the home is most likely already insulated and drywalled as required by local building codes for fire resistance, which will bring the total cost even lower. For insulation, two common choices are spray foam and fiberglass batting. Fiberglass insulation is roughly one-third the cost of closed-cell spray foam insulation and is considered very easy to install, but it allows a lot of air leakage. Closed-cell spray foam, in contrast, is substantially more energy efficient, as it provides a complete air, moisture, and vapor barrier. Spray foam insulation is also superior because it does not sag and settle over time like fiberglass batts tend to do and because it forms a tight seal around outlets, light switches, and other areas where drafts tend to be felt. Drywall, such as the popular brand Sheetrock, is the traditional option for finishing the walls of a home. You get a nice, smooth, finished surface and the benefit of fire resistance. For garage walls, however, the extra cost of taping, mudding, and painting drywall can be a drawback. In addition, drywall is prone to dings and dents, which is not ideal in the rough-and-tumble world of a garage. Wood sheathing, such as oriented strand board (OSB) or plywood sheathing, can be cheaper to install than drywall. 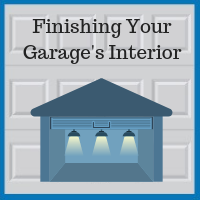 Many people find the look of the unfinished wood perfectly acceptable for a garage, and it can be painted if you want to brighten up the color and make the space feel less dark. You can also drive screws into OSB and hang things from the walls without having to find a stud the way you do with drywall. Slatwall panels made of PVC are another option to consider for at least one wall in your garages. Slatwall is the more attractive, more durable, and more functional cousin of old-fashioned pegboard. Slatwall is significantly more expensive than wood sheathing or drywall, but it comes in a variety of colors and never needs painting. You can hang a variety of hooks, bins, and shelves from slatwall and easily rearrange things as needed. Whether you want to update an old garage or build a brand-new custom garage, Blue Sky Builders of Downers Grove will create an attractive and affordable solution for you. Over the past 40 years, we have built or improved hundreds of garages in more than 50 different communities. For a quality garage contractor in DuPage County, call us at 630-852-8485.